If not for two storms 2,000 years apart in the same area of the Mediterranean, the most important technological artifact from the ancient world might never have been discovered. This deeply mysterious and historically significant object represents an altogether more advanced technological sophistication than had previously been thought possible for this era. Some historians suggest the Antikythera device may have been created by Archimedes at least indirectly as Archimedes is known to have built planetaria devices that model the movement of planets and the sun of similar make and function . Two such devices that also used gears were said to have been rescued from Syracuse when it fell in 212 BC. References to devices are found in classical literature, including Cicero’s mention of one made by Archimedes although only the one Antikythera device has been found. The Antikythera device is believed to be one of the most intricately designed antiques in existence who’s detail duplicates that of a Swiss watch. The device, thought to be at least 2,000 years old was found by chance by sponge divers off the Antikytheran coast, in the wreckage of a Roman cargo ship. The device was very thin and made of bronze. It was mounted in a wooden frame and had more than 2,000 characters inscribed all over it. 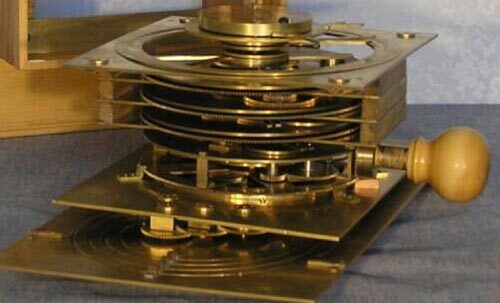 Today it is believed that this instrument was a kind of mechanical analog computer used to calculate the movements of stars and planets in astronomy. 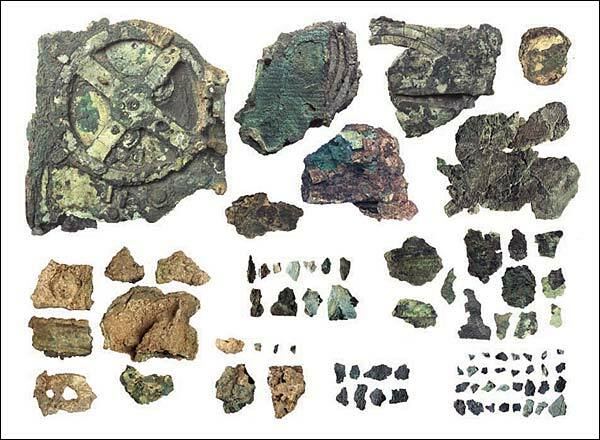 It has been estimated that the Antikythera mechanism was built around 87 B.C and was lost in 76 B.C. 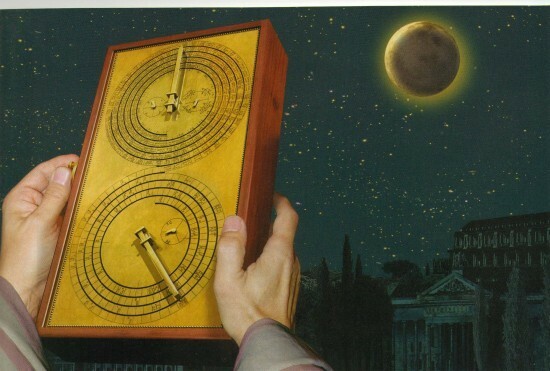 The ship was Roman though the Antikythera mechanism was developed in Greece. One theory suggests that the reason it came to be on the Roman ship could be because the instrument was among the spoils of war acquired by then Roman emperor Julius Caesar. It appears to be constructed upon theories of astronomy and mathematics developed by Greek astronomers, and one hypothesis is that the device was constructed at an academy founded by the ancient Stoic philosopher Posidonius on the island of Rhodes, which was known at the time as a center of astronomy and mechanical engineering, and that perhaps the astronomer Hipparchus was the engineer who designed it, since it contains a lunar mechanismthat uses Hipparchus’ theory for the motion of the Moon. X-rays of the device have revealed at least 30 different gears that comprise the mechanism. It was not until 1959 that Derek Price, a British historian who has done extensive research suggested what the Antikythera mechanism may have been used for. Price put forth the theory that the device was used in astronomy to make calculations and predictions. 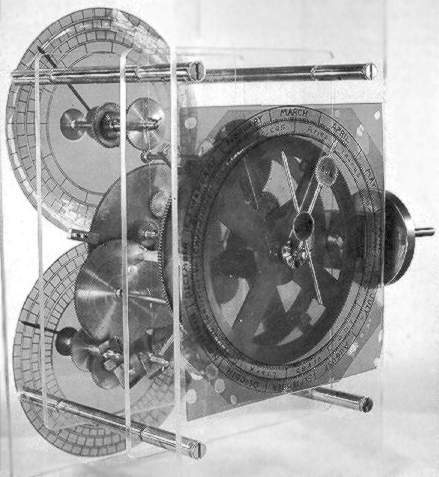 In 1974, Price presented a model of how the Antikythera mechanism might have functioned. When past or future dates were entered into the device it calculated the astronomical information related to the Sun, Moon, and other planets. or steel but these would have surely perished under the electrochemical affects of the Mediterranean sea where the device was found. two at the rear . The front dial has two concentric scales. The outer ring is marked off with the days of the 365-day Egyptian calendar, or the Sothic year, based on the Sothic cycle. Inside this, there is a second dial marked with the Greek signs of the Zodiac and divided into degrees. The calendar dial can be moved to compensate for the effect of the extra quarter day in the solar year (there are 365.2422 days per year) by reversing the scale one day every four years. Interestingly the Julian calendar, the first calendar of the region to contain leap years, was not introduced until 46 BC, up to a century after the device was said to have been built.